Umm Ali, was the first food/dessert that I first fell in love with, in this beautiful city of Abu dhabi. It was introduced to me by DH. He brought some back with him once from his office party. It was served at every parties they had in office. And this made me keep praying for more parties :). It was only later I could trace out places where these were available. And after a while I started making them, once my taste buds could identify each and every ingredient went into them. The base of this dish is baked puff pastries but I have come across those made with fillo pastry or croissants. Croissants make it more like a bread pudding. I love it with puff pastry and the first ones I had was made with them. This dessert is a Ramadan favourite here which can be seen on Iftar tables. When I was asked if I can do a guest post by one of my fellow blogger at her place, whom I got acquainted through the Muslimah Bloggers Community, this was the one dish that came up on my mind. As this is a huge hit whenever I have made it and as it suits Ramadan well I thought this would be the best choice. And the host blogger added my joy when she tried it and told me how much she loved it. Now all said I would like to introduce her. Hina Nafe was born and bought up in Pakistan and is currently a practicing Chartered Accountant at one of the Big Four Firms in New Zealand. Besides accounting and numbers, she enjoys writing. Her writings can be found at Hina's world. Umm Ali aka Omali is a Middle Eastern dessert thought to be originated from Egypt. 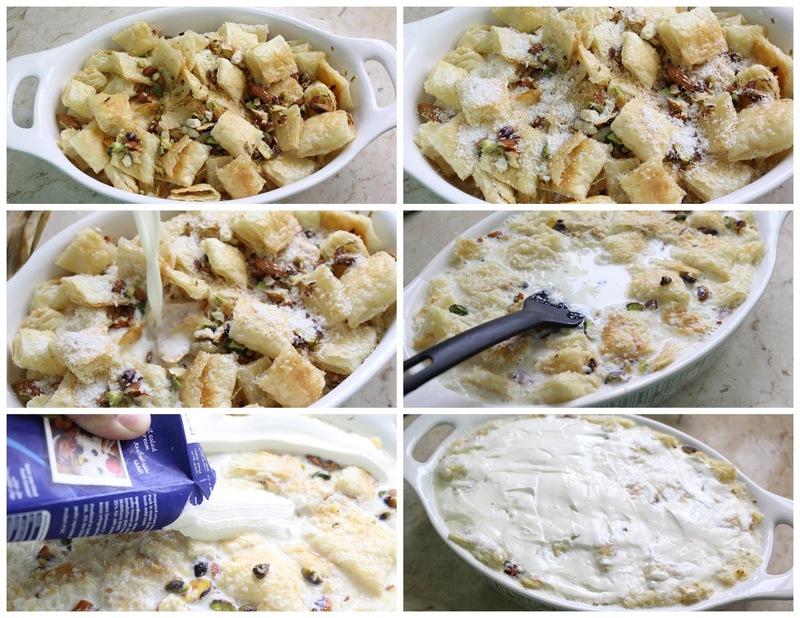 It resembles bread pudding in its looks but has a completely different texture and flavor. This is commonly served at Iftar during Ramadan here in the UAE. It can be related to a comfort food rather than just a dessert. It is commonly served warm but can be had as a cold dessert too. Bake the puff pastry square as per the package instructions until crisply puffed up and golden. Meanwhile, In a saucepan heat the mixture of milk, sweetened condensed milk, sugar just until boiling.Add in the vanilla extract and remove from heat. In a small frying pan heat the butter/ghee and toast the nuts lightly and keep aside. Take a pie pan, shred the puff pastry square into medium size bits. Then add the nuts and coconut and spread out using a spoon between the pastry layers. Now pour the heated milk mixture over the pastry flakes.And let it soak for a few minutes.Press gently using a spoon so that it soak up faster. Finally spread the thick cream over the top of the pan evenly over milk pastry mix. After baking place under the broiler to get a nice golden top crust for the dessert. You can also toast the coconut with the nuts lightly to add some texture to the dish. The Thick cream is just my addition to give it a crust and it can can be omitted, but I love the look and texture it adds to the dessert.